Niwa Gekidan Penino "Egao no toride (Fortress of Smile)"
Toyooka Art Season 2018｜Event | Kinosaki International Arts Center" /> Niwa Gekidan Penino "Egao no toride (Fortress of Smile)"
now reborn with an all new cast. A re-creation of the original performance of "Fortress of Smile". It was performed in Tokyo and Osaka in 2007, and written and directed by the playwright and director Kuro Tanino. 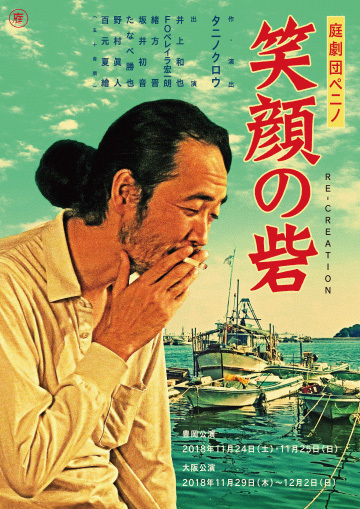 "Niwa Gekidan Penino" delivers a drama about people who live in an apartment in a small fishermen's village. 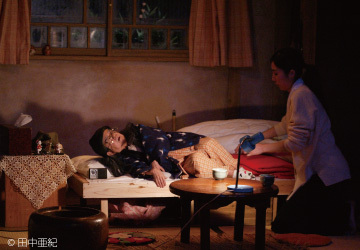 Not only did Tanino succeed in illustrating both human connection and solitude, he also captured the distortion of contemporary society through depicting the problems of dementia and hospice care. 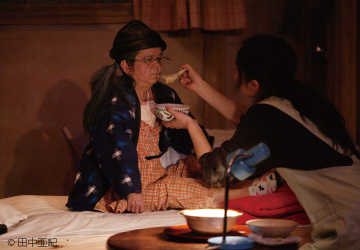 The work was nominated for the Kishida Prize for Drama in 2008. This highly acclaimed production will be revised considerably in order to create a new version where actors from the Kansai region will play the roles. Pursuing an entirely realistic vision, Tanino will produce the scenography and go on to conduct research in fishing villages. After its debut in Osaka this December, the new production will be touring in other cities in Japan as well. For those who would like to make a reservation, please contact us by phone at the Kinosaki International Arts Center by November 16th (Friday). Planning and production: Arche, LLC.